How often do you throw away your contact lenses? It is amazing the responses you can get on this simple question. As an optometrist, I have had patients that have been wearing their same trial pair of contact lenses they were dispensed at an exam 2 years ago. Most people aren't that daring, but it is not uncommon to have people wearing lenses for months longer than FDA guidelines recommend. And most patients are very defensive about just how often they are throwing their lenses away. Why do I recommend following FDA guidelines for proper contact lens disposal? Here are 5 very real complications that I treat on a regular basis that are a result of improper contact lens wear. Treatment = Change to more oxygen permeable contact lenses or daily wear. If severe enough, contact lens wear may have to be discontinued permanently. GPC is one of the most common acute conditions I see from contact lens overwear. What will you notice? Increased discomfort with your contact lenses, and even worse irritation when the contact lenses are off. Many of my patients complain of excessive movement with their contact lenses (that has just recently occurred). 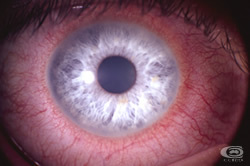 The large bumps pictured under the eyelid are papillae, which are an acute allergic inflammation that the body mounts against any protein build-up on the surface of the contact lens. 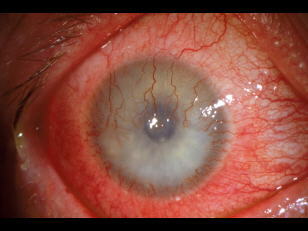 Commonly abbreviated as CLARE, this acute onset red eye is also a side effect of poor oxygen levels to the cornea. Remember that the cornea receives most of its oxygen from the atmosphere, so when you sleep and your eyelids close, you are depriving your cornea of oxygen to some degree. Now put a contact lens on the cornea, and those levels go dramatically down. This is why most doctors NEVER recommend sleeping in lenses as the ideal form of contact lens wear, and when you do sleep in your contact lenses you need to be prescribed a special contact lens made for extra oxygen delivery. If you have CLARE, you will wake up with red, irritated, watery eyes. Best thing to do is take those contact lenses out and throw them away! 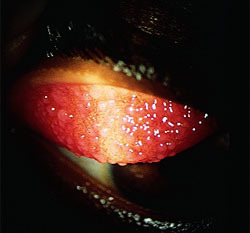 If the picture isn't enough to sway you, let me just emphasize the fact that you do NOT want a corneal ulcer. They are painful. They are really nasty looking. They cause permanent scarring. They can take a very long time to heal up. Did I mention they are VERY painful? Corneal ulcers come in all shapes and sizes, and most are smaller and located more towards the periphery. When I do see a large central ulcer, that means immediate referral to a corneal specialist. 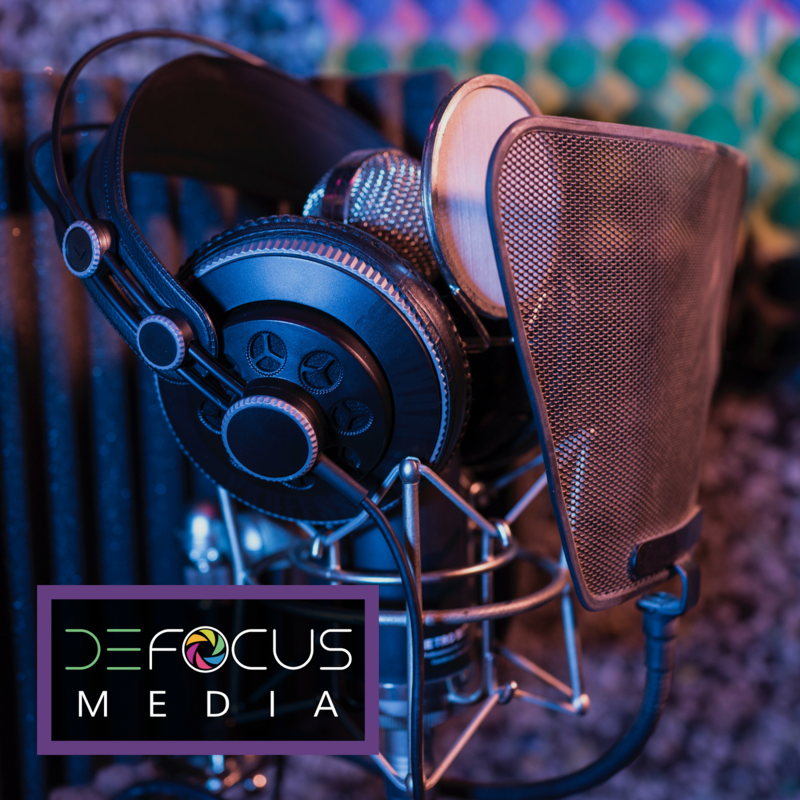 If your ulcer is anywhere near your pupil (where light passes through to allow you to see), then you are going to have a permanent scar obstructing your line of sight! Where do these ulcers come from? Like most of the problems we've discussed, a lack of oxygen is a trigger. 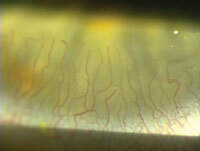 When the cornea is deprived of oxygen the integrity of the tissue is weakened. Bacteria on your contact lenses can then penetrate the cornea and result in the ulcer. Treatment = No contact lens wear for several weeks (or indefinitely depending on the severity). Frequent antibiotic use (typically every hour round the clock in severe cases). 5) YOU ONLY GET ONE CORNEA PER EYE. FOREVER. I frequently tell my patients who are overwearing contact lenses that their cornea has to last them to age 100. You don't want to be depriving it of oxygen in your teens or twenties! Here's another question that I have heard doctors pose: "would you sleep in the same pair of undewear for months at a time without washing it?" Your contact lenses are very prone to accumulating bacteria, so it is very important to properly clean them and throw them away at the end of their lifespan to ensure you aren't depriving your eye of the oxygen it needs. If you have a red eye, remove your contact lenses and see your doctor. Most of these conditions require a high powered microscope to properly diagnose. How much money are you really saving by overwearing contact lenses when you take into account that if you get a contact lens complication, the office visits and cost of medicated eye drops is very high? Not to mention the fact that you will be causing permanent damage to the health of your eyes. If you wear contact lenses, you need a pair of glasses. No exceptions. If you can't see to drive legally without contact lenses, you MUST have back-up glasses. I don't care how old they are. They just need to be good enough for you to use in case you have a complication where you have to be out of contact lenses. It is sad that many people do not understand this information or have access to it. I feel it is often a lack of education from the doctors end. If eye care professionals would spend more time informing their patients regarding the risk of eye disease due to CL overwear, I feel less complications would arise. But then, there are others who wish not to heed the advice since they have abused CL's for years without complications. I have many of these in my office, and there are many who return years later with obvious signs of problems, often times a corneal ulcer. This column does an amazing job of describing the real risk of CL abuse. Keep up the great work. Thanks! I'm hoping we can help spread the word about the real dangers of contact lens overwear--and these things are what your doctor looks for at every contact lens evaluation to make sure your eyes are safe for lens wear! Great article. As an optom, I am coming across more & more contact lens wearers who have never been professionally fitted either. Order online & then self teach via You Tube how to I&R, so never get any proper advice on how to care for their C/Ls (wearing times, early warning signs etc.) and the importance of regular a/care appointments. Neovasc. is painless with no symptoms. All to save the cost of a fitting fee (€95) or a/care (€50), which is insane! I once came across a px (spherical) who had self prescribed herself toric C/Ls because she had heard they would be more comfortable. VA dreadful, but still refused an a/care!